Serendipity. A silly word. Pretentious in all its syllables. Plumbers and purveyors of ice cream think of “dip wells”, where an ice cream scooper rests under a perpetual flow of water between customers. The office staff had their ideas: Pink Oxford, plaid pants. Croquet on the south lawn with Buffy and Trevor”. Whatever all that means. Maybe its time for their tea and biscuits. Our glorious local library, stocked with DVDs from world-wide TV series, recently acquired 800 Words of New Zealand fame. The word serendipity came up. With an actual definition (according to their editors). Serendipity is a word coined over 250 years ago by the English author Horace Walpole from the title of a fairytale in which the heroes were always making discoveries by accident. – George, 800 Words. Season 2, Part I, Episode 4. While taking a break from convoluted inter-cabinet quad coiling during the installation of a T&S Brass glass filler at a local college *hic* institution, I strolled the aisle between bar and beer merchandiser. And upon the morning buffet table spied a new, most impressive wall clock. “The kids broke the old one. Brian just got this. We have to hang it”, explains Bonnie. A beautiful, brand new Yuengling neon wall clock manufactured in Perryopolis PA. The same clock company featured last week. The beer of my formative years. No ATB article yet on tap. Content drops onto my mental keyboard. “Order up“, I imagine Hanif calling through the kitchen window. America’s oldest brewery, Yuengling, of Pottsville PA, buys their promotional clocks in Perryopolis. Yuengling Traditional Lager, elixir of the Gods, a perfect mate to pizza, pretzels, and stuffed Italian hoagies, immortalized upon a beautiful 20″ neon clock. 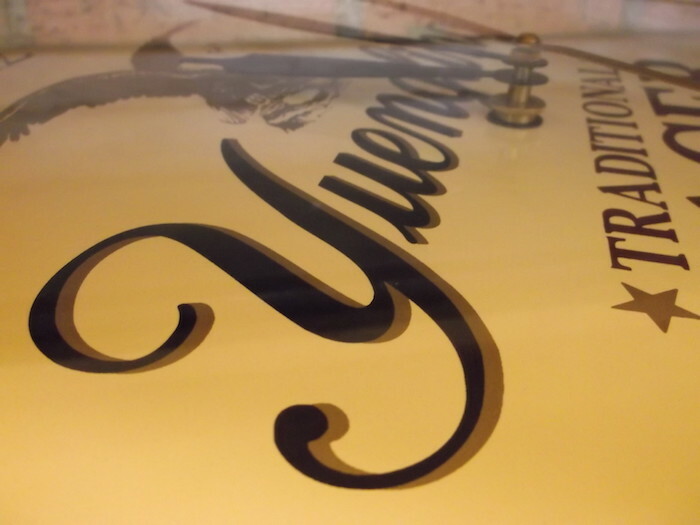 Logo expertly screened onto sheet aluminum. Powder coat exterior finish. Optical glass – will not “yellow” over time – secured to the bezel with industrial epoxy. A real gem of a clock. Magnificent craftsmanship. The picky plumber finds not a single hair out-of-place. SIX thumbs up to all!!! What about this serendipity stuff? I’ve almost forgotten myself. It was having no piece completed for deadline, installing one American-made product, and seeing another which worked better for the article. Sort of like desert to last week’s main course. Discovered in a fine 5th generation restaurant. Cheers! This entry was posted in Product Review and tagged cavanaugh's west philly, neon clock image time, perryopolis, yuengling. One of our favorite clocks to handcraft!!!! Glad to see it displayed proudly!!! MADE IN THE USA!!! I put the clock on the wall yesterday afternoon. Calling out, “Who has the time”, pub owner Brian P. Pawliczek was the first to answer. He is especially glad to have that clock in action. I wanted to relocate the clock but he insisted a clock be exactly there, so pub patrons could easily see the time.